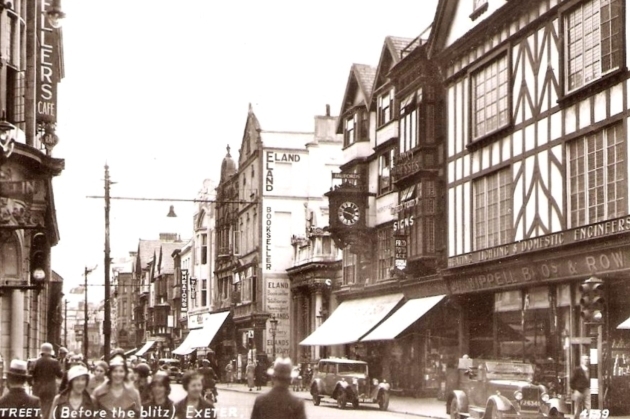 This is a follow-up to an earlier post, 'The Destruction of the High Street Before 1942', and a brief summary of the Exeter Blitz can be found here. The photograph above from c1920 shows the view up the High Street looking east towards Sidwell Street. If nothing else it shows the wonderful architectural diversity of the pre-war High Street, the product of centuries of gradual evolution. The tower of St Lawrence's Church is about halfway up on the left. The entrance into St Martin's Lane is in the foreground on the right. Apart from the altered facades of No. 226 High Street and No. 227 High Street, and St Stephen's Church (whose weathervane can just be seen poking above the rooftops on the right), not one of the buildings shown in the photograph remains standing today. Not all of the buildings shown in the image were destroyed in 1942. For example, the ornate stone bank on the corner of St Martin's Lane and the timber-framed house with oriel windows next to it (No. 37 High Street) were demolished in the 1950s. No. 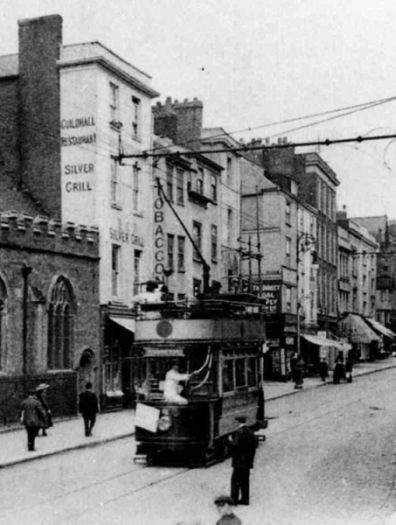 229 High Street, just beyond the tram on the left, was demolished in 1930. 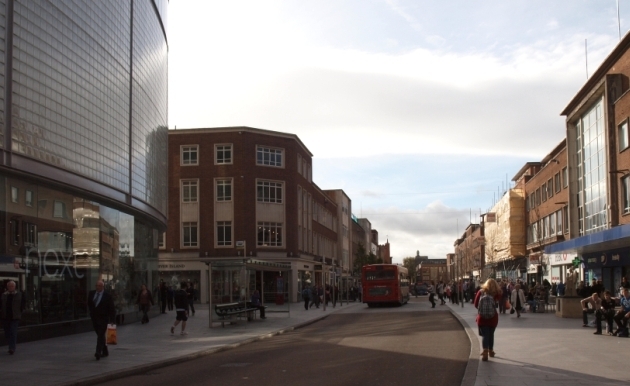 But it does show the approximate extent of the wartime destruction of the High Street and a complete historical street scene which has disappeared forever. Pevsner wrote that "the German bombers found Exeter primarily a medieval city, they left it primarily a Georgian and early-Victorian city. The close-knit pattern of medieval streets and alleys, medieval churches and houses is irretrievably gone". This perhaps needs some qualification. 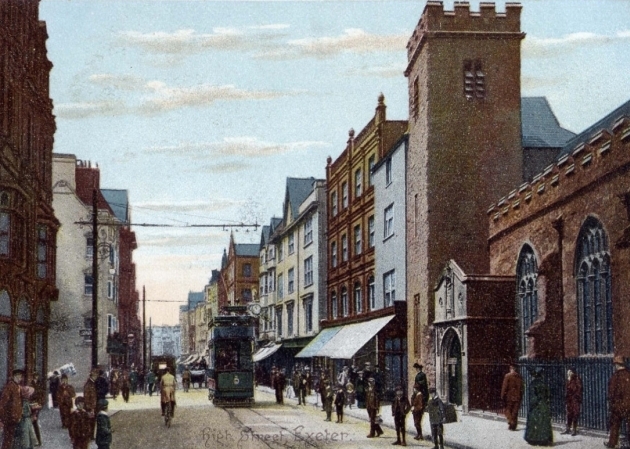 By the end of the 19th century, anyone wanting to experience a visual flavour of medieval Exeter beyond the Cathedral Close would've had to trek to the forgotten slums of the West Quarter, to Preston Street, Smythen Street, Frog Street and Stepcote Hill, to Paul Street, Mary Arches Street and parts of Catherine Street. By 1942 much of Exeter's surviving medieval fabric had already been swept away through slum clearances. 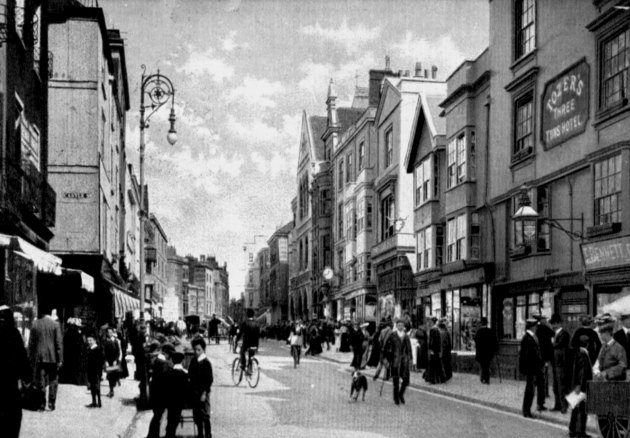 The High Street itself had been one of the first parts of the city to experience modernisation in the 18th and 19th centuries. 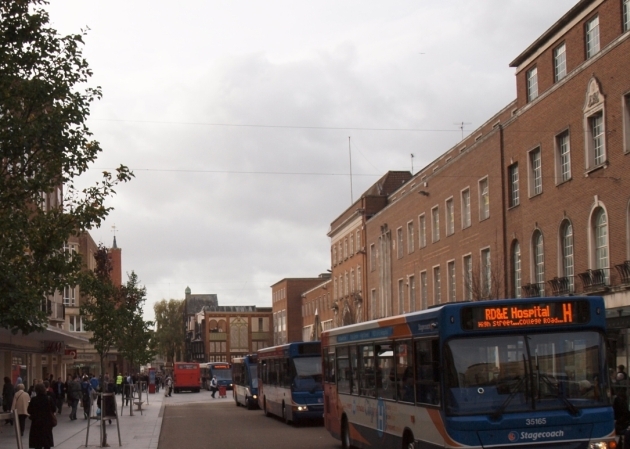 And on the surface at least, Exeter was far from being a medieval city. But in a real sense Pevser was quite right. The fingerprints of the Middle Ages were still in evidence all across the city, primarily in its street plan, in the presence of the Castle, Cathedral and Guildhall, and in the survival of many of the medieval tenement plots, all of which were encircled by the majority of the medieval city walls. And there were almost certainly many medieval and early post medieval buildings hidden behind altered facades and embedded in later structures. Unfortunately most of the individual tenement plots were eradicated between the post-war reconstruction of war-damaged areas and the various redevelopments of the 1960s and 1970s. During the same period much of the ancient street plan was either either rerouted or totally/partially obliterated e.g. George Street, Bampfylde Street, Milk Street, Goldsmith Street, Pancras Lane, Little Stile, Sun Street, Chapel Street, Guinea Street, Coombe Street, James Street, Catherine Street, Frog Street, Edmund Street, James Street, Musgrave Alley and King's Alley. Almost miraculously, the Castle, Cathedral and Guildhall still survive. Anyway, the High Street on the eve of World War Two was one of the most picturesque streets remaining within the boundary of the city wall, perhaps notable for its rich architectural variety than for any single building. The Exeter Blitz began at around 1.50am in the early hours of 04 May 1942 and only lasted for about 80 minutes. 75 tonnes of bombs were dropped by 40 planes including 160 high explosives, parachute mines and around 10,000 incendiaries. The resulting fire was seen up to fifty miles away. 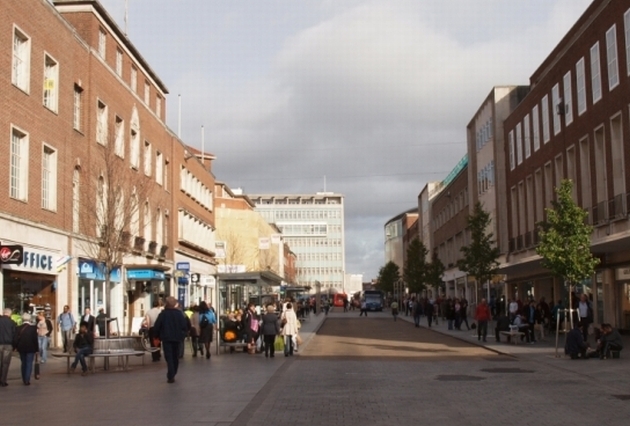 By dawn 156 people had died, large parts of central Exeter lay in ruins and about 50% of the High Street, Exeter's foremost thoroughfare, had been irreparably destroyed.
. 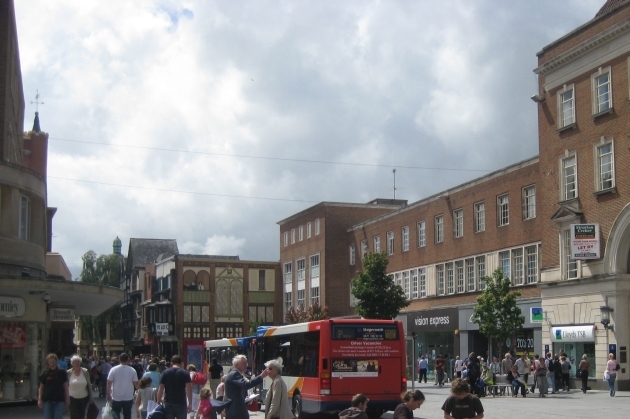 The image left shows the extent of war-damage in the High Street following the Exeter Blitz. It is based on a 1905 map of the city overlaid onto a modern aerial view of the same area. Only the section of the High Street affected by the air raid, around 50% of its total length, is shown. 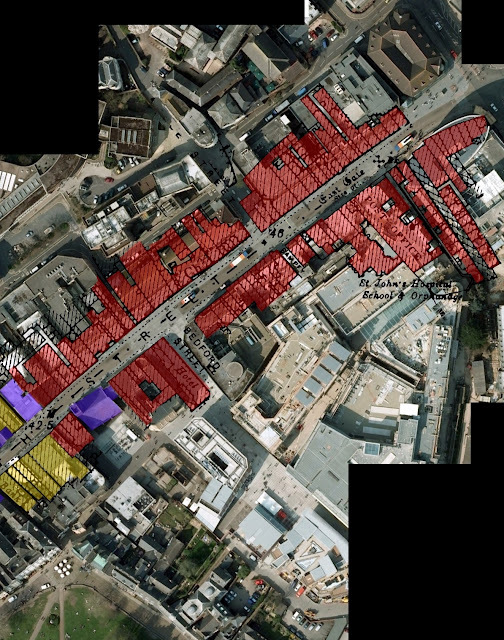 The buildings on the tenement plots highlighted in red were nearly all completely destroyed down to ground level. Some had already been rebuilt prior to 1942 e.g. the Half Moon inn on the corner of the High Street and Bedford Street, but the High Street of 1905 was largely the same as the High Street of 1942. The late 19th century Post Office and Eastgate Arcade, which replaced St John's Hospital School, are to the right. A cross marks the site of the great medieval East Gate. The two most westerly pre-war buildings now surviving on the High Street are highlighted in purple: on the north side No. 229 High Street built in 1930, and on the south side St Stephen's Church. 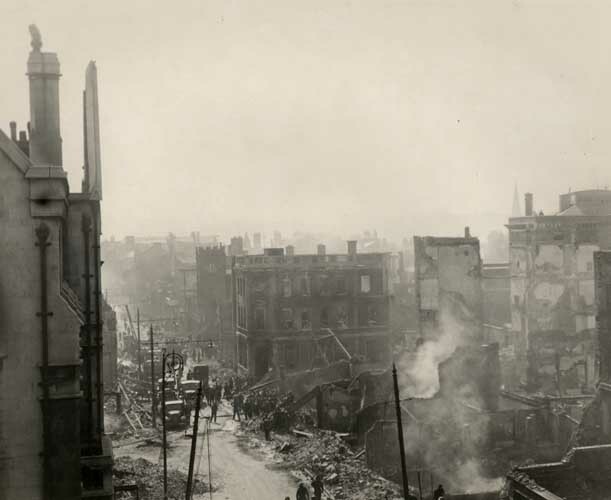 The image doesn't show the extensive network of courtyards, alleyways and smaller structures which existed at the back of the buildings fronting onto the High Street but which were also destroyed during the air raid. 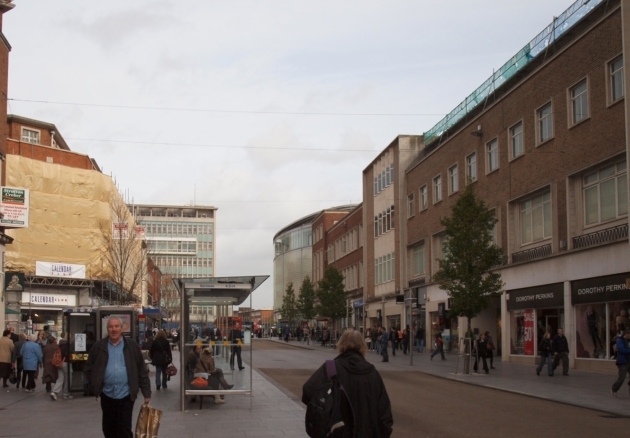 The gargantuan bulk of the Princesshay Shopping Centre which now squats on the site of Bedford Circus is easily visible to the south of the High Street. Drag the slider in the centre of the photographs below to see before and after images (or click on 'Show only then' or 'Show only now'). 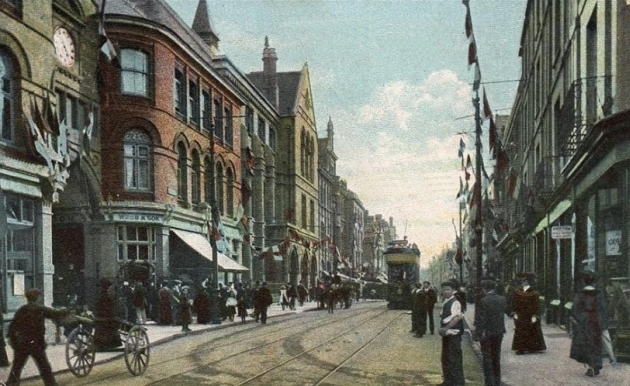 The photo above is from c1910 looking down the High Street towards the west. The brick entrance into the Eastgate Arcade is on the left. Slightly further down on the same side is the stone Gothic Revival facade of the main Post Office. The properties on the immediate right were built c1830 and marked the corner of the High Street with London Inn Square (now the site of 'Waterstones'). 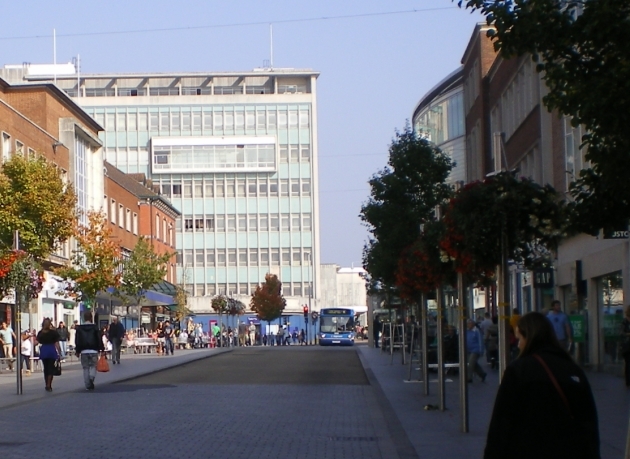 The photo above shows the High Street looking east towards Eastgate and, in the far distance, the start of Sidwell Street (now occupied by the tower block at Nos. 1 to 11 Sidwell Street). The Eastgate Arcade and Post Office are on the right. In the centre of the photo are the premises of The Cathedral Dairy Company (you can just see the lettering on the side of the wall). This was at Nos. 6 & 7 Eastgate, beyond the boundary of the city walls. The premises were converted out of the late 18th century residence of the headmaster of St John's Hospital School. The small, three storey timber-framed house on the left was No. 264 High Street. Before the start of the 20th century the date 1597 was written under the gable but by the 1930s this had changed to 1297! The late 16th century date is probably much more accurate. Unfortunately such externally ancient buildings were a rarity in the High Street by 1942. Next to No. 264 is a tall building with a gable end facing into the street, No. 265. This only dated to 1893 and replaced the much-earlier Apothecaries' Hall, formerly at No. 246 High Street. Next door to No. 265 is the Georgian facade of Nos. 266 & 266 High Street, fashioned in the 1780s from stone recycled from the East Gate. Just about visible is a niche at first-floor level which contained the gatehouse's statue of Henry VII. The photo above c1900 was taken looking in the same direction i.e. towards Eastgate. 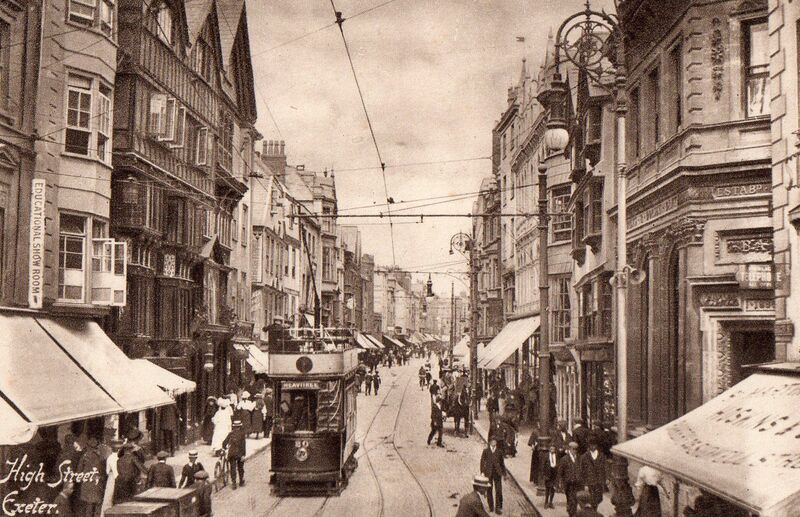 Electric trams had yet to be introduced into the High Street so the image dates to before 1905. If that dog was in the High Street today it would probably get run down by a minibus! The Post Office and Eastgate are still visible on the right. The entrance into Castle Street, which ran up to Rougemont Castle, is on the left. The entrance was much narrower before 1942 and was massively widened during the post-war reconstruction. The three-storey gabled house on the right, from c1600, stood at the High Street's junction with Bampfylde Street. Another very narrow street, Bampfylde Street was dominated at its far end by the magnificent Bampfylde House. To the far right is the Three Tuns inn at No. 8 High Street. In 1836, at the rear of the Three Tuns, workers unearthed a subterranean chamber described at the time as a "Roman sepulchral family vault". The chamber was 7ft square with an arched roof. Around the walls were niches containing five urns believed to contain the cremated remains of some of Exeter's Roman citizens. The inn closed in 1913 but the premises survived until they were destroyed in 1942. The photo above dates to c1930 also showing the view towards Eastgate. The south wall of St Lawrence's Church is on the left. The former Three Tuns building, now missing its first floor windows, is the fourth along on the right. Apart from St Lawrence's Church and the stone Post Office, nearly every other building shown was destroyed to ground level during the Exeter Blitz. This was almost certainly a consequence of most of them being constructed in the 18th century or earlier on timber frames with lath and plaster facades. Next to St Lawrence's is the arched entrance into the Empire cinema, Exeter's first, a not particularly attractive addition from 1911. Comparison between the 'then' and 'now' photos vividly shows how much this part of the High Street was widened during post-war reconstruction. The photo above is taken from about the same place as the previous one but looking in the opposite direction c1910. St Lawrence's Church is on the right. Most of the building dated to the 15th century although the south wall, visible in the photo, was rebuilt in 1674. The stone for the porch was recycled from a late 16th century water conduit which stood close to the church until the conduit was demolished in 1694. The conduit was adorned with statues of Henry VIII and Elizabeth I. The statue of Elizabeth was placed above the porch when it was added to the church in the 1690s. Although the interior of the church was gutted in 1942 the south wall, medieval bell tower and porch survived the air raid only to be demolished during the post-war reconstruction. Running under the building to the immediate left of the church was a covered passageway which led, since 1692, to a small churchyard. Beatrix Cresswell described it in 1927: "Just beside the tower is the narrowest possible slip which surprises the enterprising wanderer by leading him into a tiny courtyard where there are two little houses, their porches overgrown with white jessamine, and a fat friendly cat offers a welcome." Cresswell thought it was "a delicious corner of the old city, with the red wall and cusped windows of the old church at one side of it". Unfortunately it was all destroyed in 1942. On the opposite side of the street can be seen the side wall of the Half Moon inn at the entrance into Bedford Street. By 1942 the Half Moon had been replaced with Deller's Cafe (see photo below). The photo above c1930 shows the most attractive ensemble of buildings destroyed in the High Street in 1942. 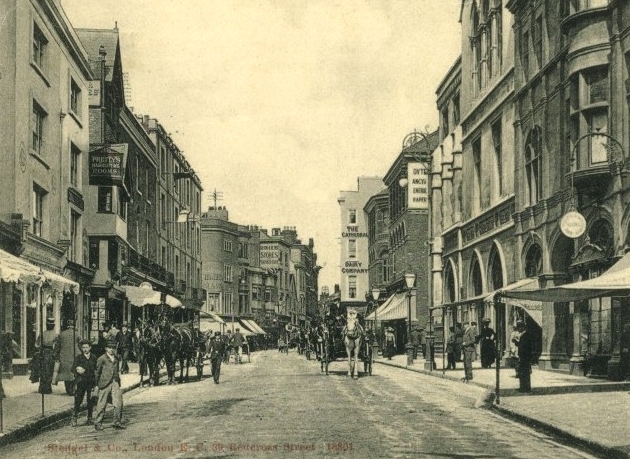 The sign for Deller's Cafe is on the far left although the main entrance was actually via Bedford Street. Most of Deller's exterior stonework and some of the ornate interiors survived 1942 but were demolished during the post-war reconstruction. Not visible in the photograph but a little further down on the same side was the site of the New inn at Nos. 25 & 26 High Street. The building still contained the 'Apollo' ceiling created by Thomas Lane between 1689 and 1690, destroyed in 1942. Most notable of the buildings on the right was Brufords at No. 241 High Street, a fine 17th century townhouse which once belonged to the Earls of Morley. Its most notable feature was a clock which projected over the pavement supported on the back of an enormous carved figure of Father Time. To the left of Brufords can just be seen part of the neo-Classical facade of the West of England Fire and Life Insurance Company at No. 237 High Street. The facade, built in 1833, was surmounted by a colossal statue of King Alfred, the Company's emblem. Although the rest of the company's buildings were gutted during the air raid the facade survived. It was subsequently demolished during the post-war reconstruction. The modern photograph of the same area shows the side wall of No. 229 High Street. This marks the extent of the wartime destruction, although No. 229 lost its gabled roof during the air raid. It's easy to see how the pre-war line of the street was pushed back during the reconstruction against the recommendation of the city's post-war town planner, Thomas Sharp. The mural has since been replaced with that of a smiling woman with a tower block in the background. The exterior timber work of the two buildings on the far right was a relatively recent addition in 1942. Although the buildings were probably 18th century or earlier, the timber facades were applied c1920. Thomas Sharp would've hated their lack of authenticity but I think they made a very attractive addition to the High Street's general appearance. 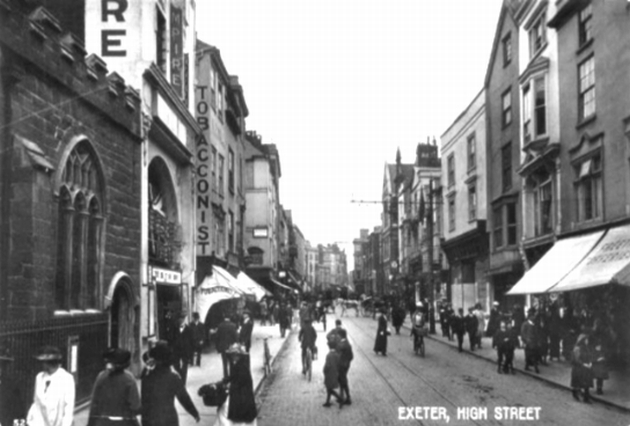 The photo above (Courtesy of Devon County Council) shows the view down the High Street within hours of the Exeter Blitz. Smoke is curling up from the ruins. The photo must've been taken from the roof of the burnt out post office building. The post office's stone gable and downpipes can be seen to the immediate left. The crenellated tower of St Lawrence's Church can also be seen in the distance. 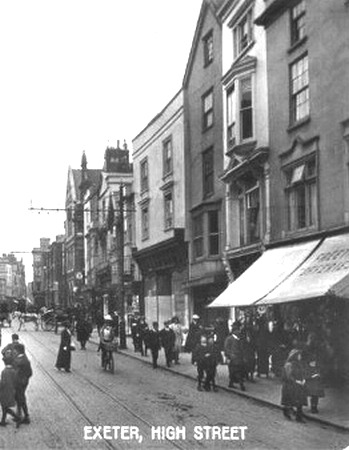 The burnt out building in the centre of the image stood on the corner of the High Street with Castle Street. The photo below shows part of the rebuilt High Street c1953, prior to the construction of the monolithic 'Bobby's' department store. The wide horizontal lines of the post-war buildings were a total break with the narrow vertical appearance of the pre-war streetscape. One reason for the widening was to allow for a dual-carrriageway to run through the middle of the street! Whatever were they thinking of. 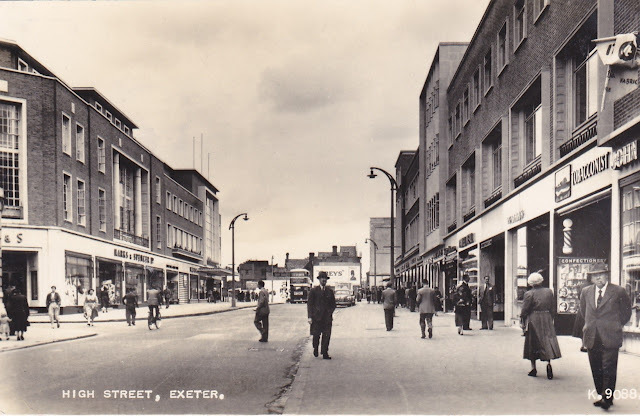 Unfortunately the Exeter Blitz wasn't the end of the 20th century's effect on the High Street. Although 50% of the street was destroyed in 1942 around half survived without any damage. Between 1950 and 1980 the remaining 50% had been reduced again by half leaving just a small fragment to stagger on into the 21st century. The demolitions between 1950 and 1980 will be the subject of part three of this series of posts. My family moved to Exeter in January 1942 after the Cardiff blitz and took rooms at Tarbet Avenue off the Pinhoe Road.We had a lounge /diner with a Morrison shelter and in that room our upright grand piano.After the bombs hit Tarbet Avenue about 25 metres away we were taken to a Church Hall in Pinhoe Road.Our piano was holding up one interior wall but the house was badly damaged and thieves stole my stamp collection.We found a kindly Dr. Forse-Jones at the top of Telegraph Hill( on the road to Newton Abbot) who put us up for several months until we found a house to rent in Kennerley Avenue Whipton.I had just been accepted at Exeter School and on the majority of occasions had to hitch-hike into school because on reaching Telegraph Hill the rare bus would be full.I was often late !The bungalow of the Doctor is now a café.His family eventually moved to Cullompton.The piano(rebuilt) is with my daughter in Kenley nr. Croydon.I still keep in touch with my old school friend John Taylor who used to live near Pinhoe and after Whipton.My father took me to see the burning High Street the following day.People were very resilient and I seem to remember a radio shop(KIRK?) opening soon after in a makeshift temporary shop near the High St junction with Paris Street. ?My mother had an old school friend living at Dunsford where her husband was the Blacksmith.He gave my mother a plan of where he had buried biscuit tins full of £5 notes to avoid any invading Germans finding them!About 15 years ago I called at Dunsford and met Jack's daughter who had never been told about the biscuit tins.